For some years now, foreign ministries throughout the world have been experimenting with virtual embassies. In 2007, Sweden established a virtual embassy in the popular virtual world Second Life. Meant to serve as a cultural embassy, visitors could learn about Swedish culture, view Swedish art and even participate in seminars hosted by the virtual embassy. In 2011, the US State Department launched Virtual Embassy Teheran, a web page dedicating to promoting dialogue between the US and the Iranian people. While both virtual embassies aimed to reach international audiences and promote dialogue with them, Virtual Embassy Teheran was even more ambitious as it represented the belief that digital diplomacy could succeed where traditional diplomacy had failed and that cyberspace could serve as a neutral meeting ground where Iranians and Americans could build a bridge over troubled international waters. Despite their early promise both virtual embassies failed to stand the test of time. While Virtual Embassy Teheran is still active, it has been blocked by the Iranian government thus preventing it from establishing meaningful relations with large portions of Iranian society. 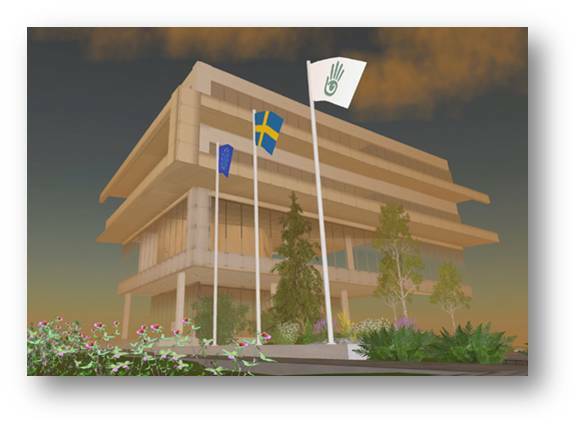 Sweden’s cultural embassy on Second Life was ultimately closed in January of 2013. Yet as foreign ministries throughout the world continue to embrace the practice of digital diplomacy, it is fair to assume that interest in virtual embassies will only grow in years to come. After all, virtual embassies may enable the achievement of the ultimate goal of digital diplomacy-creating continues meaningful interaction with foreign publics. In an attempt to follow in America and Sweden’s footsteps, Israel launched its first virtual embassy in July of 2013 only six months after Sweden closed its culture house in Second Life. Israel’s embassy, located on twitter, is meant to promote dialogue between Israel and the population of six gulf countries (known as the GCC) with which Israel does not have official diplomatic relations. Over the past year Israel’s virtual embassy has tweeted some 400 tweets and attracted 1,797 followers. Although Israel’s twitter embassy has remained active throughout the past year, averaging one twee per day, the question I find myself asking is why twitter? Why not Facebook or a dedicated web page? In fact, why not Second Life? Answering this question sheds light on the process of creating a virtual embassy. The first step in this process is defining one’s target audience. This is crucial as in the age of multiple social networks, different audiences can be found in different mediums. If one wishes to engage with the Israeli population, for example, he will need to clearly define his target audience. Most Israelis over the age of 25 use Facebook as their main social network. However, if one wishes to interact with specific segments of Israelis society, such as local journalists, than twitter may also prove a beneficial medium as most Israeli reporters and news agencies are active on twitter. Youngsters are more difficult to contact as they continuously migrate from one medium to another. In America, youngsters have flocked from Facebook to Instagram and Israeli youngsters have recently begun migrating from Facebook to twitter. The 2014 Arab Social Media Report provides extensive information regarding the use of the internet and social networks in the Arab world, including the GCC countries. According to this report, the vast majority of Arabs use Facebook as their main social network (91.28%) while twitter comes in at fourth place (57.35%). The majority of respondents in this report indicated that they mostly use social networks to gather information and news. These figures indicate that using virtual embassies in order to promote dialogue between Israel and the population of Arab countries hold much potential as this target audience is online and is seeking information and news. Moreover, thus far Israel has been unable to promote dialogue with the Arab world by using the tools of traditional diplomacy. Yet the figures also call into question the use of twitter as the medium to reach this population given the fact that the vast majority of Arab internet users can be found on Facebook. When establishing virtual embassies one should also take into account the differences between Facebook and twitter. Facebook is social by nature. Its entire design and layout promotes engagement as users are constantly offered opportunities to comment on posts and engage with other followers. In twitter most conversations are hidden and one must actively search for them. Moreover, when reviewing twitter channel one immediately sees how many re-tweets and favorites each tweet garnered but not the conversation that developed following the publication of a certain tweet. IsraelintheGCC is but one step in the long evolution of virtual embassies. But if Israel and other countries wish to succeed where others have failed they should bear in mind that the medium, the message and the audience are all tied together for the medium defines which target audiences will be exposed to the message. Posted in Uncategorized and tagged Arab Social Media Report, Digital Diplomacy, GCC, Israel, second life, Sweden, Virtual Embassy, Virtual Embassy Teheran. Bookmark the permalink. Palestine- Tweeting its Way to Statehood?